Today’s Epistle reading contains a statement that marks out Saint Paul as the true radical that he was: “There is neither Jew nor Greek, there is neither slave nor free, there is no male and female, for you are all one in Christ Jesus. And if you are Christ’s, then you are Abraham’s offspring, heirs according to promise” (Gal 3:28-29). This passage prompted me to look in other texts with similar messages. I settled on Romans 9:25: “As indeed he says in Hosea, “Those who were not my people I will call ‘my people,’ and her who was not beloved I will call ‘beloved.’ And in the very place where it was said to them, ‘You are not my people,’ there they will be called ‘sons of the living God.’” The portion highlighted in red is not in the Hebrew text of Hosea, but is in the ancient Greek version of Hosea (the version we call the Septuagint), and that’s the version Paul quotes since he writes in Greek. and a second son, named Lo-Ammi (“Not My People”): “for you are not my people, and I am not your God” (Hosea 1:9). 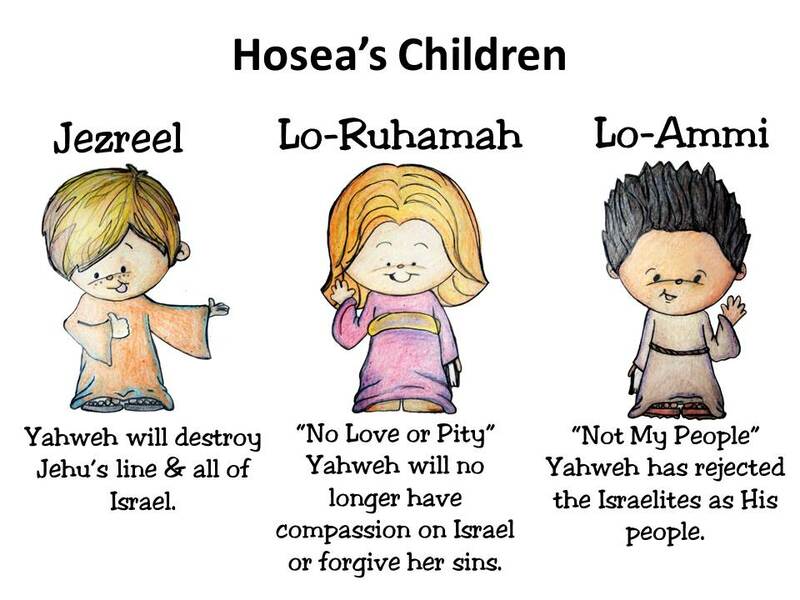 The three children are given symbolic names by God to represent God’s judgment on Israel, because Israel has acted like an unfaithful wife to her husband, Yahweh. Judgments are pronounced on Israel, but then in middle of chapter 2 something radical happens. God decides to woo his wife again, as God had done in the desert after the Exodus. The language is poetic, romantic even. and make the Valley of Achor a door of hope. as at the time when she came out of the land of Egypt. Baali means “my lord/my master” God rejects this language which implies duty of respect and honor and replaces it with language of a loving relationship. Baal was also the chief pagan god in that part of the world, and there was a whole range of gods with similar names. That is why, God refers to the Baals here in Hosea. It is here, in this concluding section of Hosea chapter 2 that Romans 9:25 includes the Septuagint addition of “Not Beloved” —> “Beloved”! This is all very powerful stuff that takes us to the passionate heart of God, Yahweh. Galatians takes these amazing statements in Hosea and makes them universal. Not only Israel/Jews, but also Greeks and all nations were once No-People but have become God’s People; were once No-Mercy and have received Mercy; were once Not-Beloved and have become God’s Beloved! Perhaps we should note more carefully what God said to Israel in the Book of Hosea: Call me Husband, not Lord, not Master. Jesus himself used the language of husband when he refers to himself as Bridegroom. God is our husband, and even when we are unfaithful and forget our vows he comes after us and woos us and entices us. 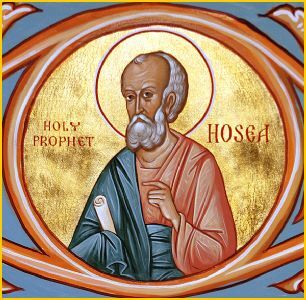 Hosea gives us an image of God as lover, as husband who does not give up on us. As I’ve said so often, there is nothing “old” about the “Old Testament”!! Because God is never old. God is always young and always in love! In love with you and with me! When will we stop looking elsewhere for satisfaction? Categories: Sermons | Tags: Galatians 3:28, God's love, Hosea, Hosea's marriage, Israel's Husband, Romans 9:25 | Permalink. Jesus told his disciples: “You are the salt of the earth… You are the light of the world” (Matthew 5:13-14). It’s a temptation to hear these words as requirement rather than blessing, as command rather than commissioning. Jesus is blessing us to be the salt of the earth, the light of the world. But let’s not make the mistake of thinking this is a pep talk, or Jesus’ version of esteem building. Jesus does not puff up people’s egos or encourage self-indulgent self-esteem, like our society does. He shows us instead our high calling. And at the same time he is challenging us; he is challenging us to grow! We are becoming more salty; we are becoming more shiny. But above all, he is saying to us today: you are a sacred space! Sacred things happen in you and through you because you are the salt of the earth and the light of the world. Sacred things are happening because of your presence in the world. “You are the salt of the earth.” These words are meant for you and for me. And salt cannot do its work unless you get the salt out of the shaker. Salt adds flavor and preserves. In the ancient world, salt brought healing; and it still has uses in healing. Jesus’ followers are salt because we add to the taste and beauty of the world. We bring out the flavor and goodness of the world. And we bring healing, through forgiveness and acts of kindness. When you forgive, you heal; you are being the salt of the earth. But salt is at its best when it doesn’t draw attention to itself. When you add too much salt to food, you taste the salt. You don’t want to taste salt; you want to taste what the salt does to the food, how it enhances the flavor of the food. The right amount of salt brings out the flavor of the food without drawing attention to itself. Like salt, the followers of Jesus do not draw attention to themselves so much as they spice up everything around them. If you’re out there drawing attention to yourself, you’re not being salty in Jesus’ meaning; maybe you’re over-salty. We are not here to draw attention to ourselves, but to add to the work of Christ and bring out the goodness already present in the world. You are the salt of the earth…and you are the light of the world. The Greek verb is λάμπω. 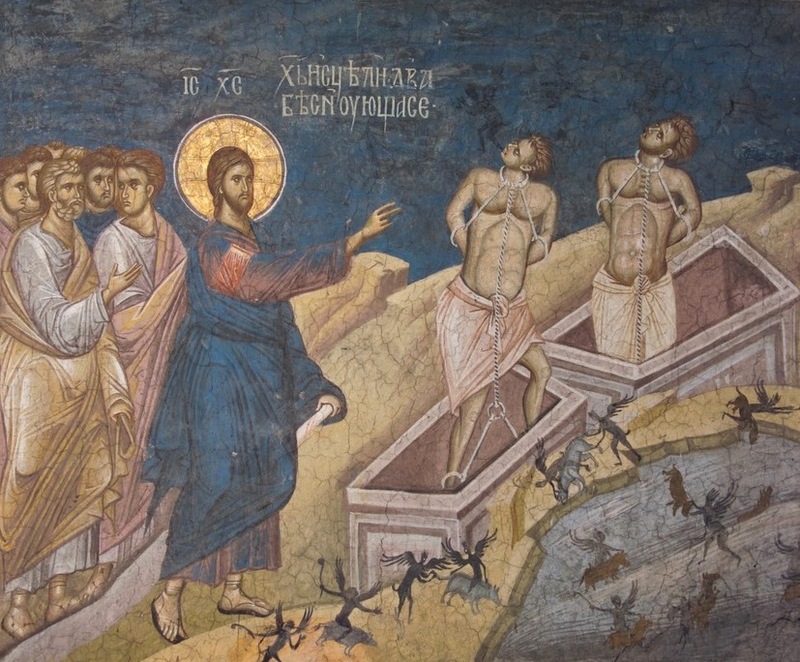 The same verb is used to describe the transfiguration of Christ – ἔλαμψεν τὸ πρόσωπον αὐτοῦ ὡς ὁ ἥλιος (Matthew 17:2). Jesus says that his listeners are the “light of the world.” His mission is now their mission. His words and deeds are their words and deeds. The church can only be the light when it reflects the light of Christ. And just as salt brings out the flavor and goodness, so also light: it illumines and brightens the things that are good in the world and it illumines and exposes and dispels the works of darkness – and that is also part of the mission of Jesus’ disciples. “You are the salt of the earth… the light of the world.” We read these words in the context of what Jesus spoke immediately before these words, those blessings that we call the Beatitudes (Matthew 5:3-10). Blessed are the peacemakers, for they shall be called sons and daughters of God. Who are ‘salt’ of the earth? They are the humble, the ones who mourn, the meek, and those who thirst after doing what is right in the world. Who are ‘light’? They are the merciful, the pure in heart, the peacemakers, and those who receive abuse for standing up for what is right. Salt and light are metaphors that meant much in the ancient world. Today, we have plenty salt, and light comes from flipping a switch. But let’s not miss the power and intent of Jesus’ words. God is light. Jesus is light. And, Jesus says, so are you! Categories: Sermons | Tags: Beatitudes, light of the world, salt of the earth | Permalink. Compassion is at the heart of Jesus’ life and teaching because hurt is to be taken seriously. Jesus experienced everything that human hurt is. Not only did he experience hurt, he became hurt! That’s how seriously he took it. Hence his angry reaction to scribes, Pharisees and other religious types who put religion and beliefs about God above dealing with human hurt. There is a mystery at the heart of today’s Gospel (Matthew 9:1-8). Confronted with a physical ailment, Jesus first pronounced forgiveness of sins. This does not mean that the man’s paralysis was caused by sin. Jesus rejected the idea on more than one occasion (John 9:3; Luke 13:2). Mark describes a similar incident. And John describes the healing of another paralytic to whom Jesus said, “Sin no more.” Forgiveness was especially important to everything Jesus did and spoke, so we might conclude that sin is always involved in illness. But let’s be careful in saying that: Sometimes sin is indeed the cause of illness (smoking, drugs, for example). But most often sin is a result of illness!. For example, illness can lead to despair, bitterness, jealousy, anger, rejection of God, even suicide! 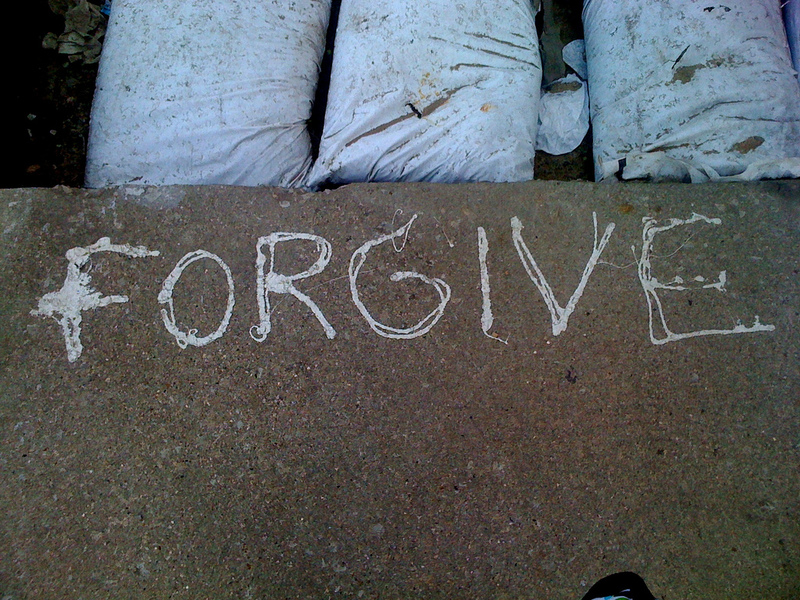 Forgiveness, therefore, is essential for complete healing. This is the part that the Pharisees didn’t understand. Yes, only God can forgive sins (as the Pharisees point out in Mark 2:7) – but we humans can help someone come to that place of total healing. We can help a person come through the anger and despair and bitterness, so that the physical healing will be more powerful when it happens. Jesus was profoundly aware of human needs. Greece today is the “sick man of Europe”. The sickness is deep, and without forgiveness nothing will happen to improve the situation. Forgiveness of debt must be part of any rescue. Without it no healing can take place. Take it from Jesus! The tragedy is that while Greece is being looked upon as a dysfunctional country, the real sickness is in Europe itself. 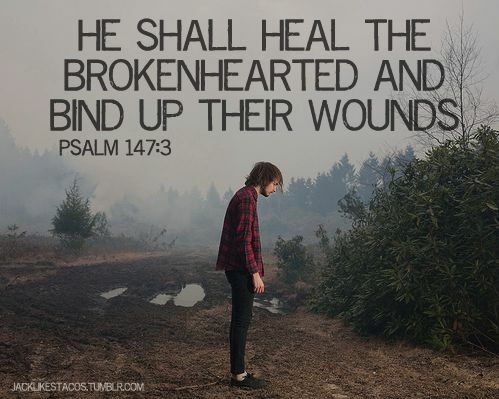 Jesus would say, “Physician heal yourself” (Luke 4:23). Europe has lost its soul; and Greece lost its own soul when it joined the euro. What a contrast to the values that should describe a Christian society. And where in the world do you find such a society? Nowhere, because no nation can possibly be Christian, regardless of what it claims to be! Listen to what St. Paul wrote in today’s reading. Do you see these values where you live? Let love be genuine (Ἡ ἀγάπη ἀνυπόκριτος); hate what is evil, hold fast to what is good; love one another with brotherly affection (τῇ φιλαδελφίᾳ εἰς ἀλλήλους φιλόστοργοι); outdo one another in showing honor. Never flag in zeal, be aglow with the Spirit (τῷ πνεύματι ζέοντες – lit. ‘boil in the spirit’ = to commit oneself completely), serve the Lord. Rejoice in your hope, be patient in tribulation, be constant in prayer. Contribute to the needs of the saints (ταῖς χρείαις τῶν ἁγίων κοινωνοῦντες – κοινωνία, sharing), practice hospitality (τὴν φιλοξενίαν διώκοντες). Bless those who persecute you; bless and do not curse them. That’s St. Paul. In the past two weeks, three times I started to write about the Greek situation, but abandoned each effort and all three exist as incomplete drafts on this website. I started a fourth attempt and it was going to be my sermon today, but decided again to not pursue it. My primary responsibility is to preach the gospel as fully and honestly as I can. I briefly mentioned Greece and Europe today, but I think it’s best for individual people to draw their own conclusions and what connections they want to make between the messages of the Gospel and St. Paul today. The message of Jesus is always relevant and up to date! Categories: Sermons | Tags: Christian nation, forgiveness, Greek debt crisis, Healing | Permalink. Matthew 8:28-9:1 An unredeemed society…. – dominated by violence and self-interest. Galatians 5:22-6:2 A redeemed society – imperfect but struggling, guided by the Holy Spirit toward perfection….. Categories: Sermons | Tags: Fruits of the Spirit, Gadarene demoniacs, Rene Girard | Permalink.